The Account Information page allows you to identify important and helpful information about your organization, such as the Address, Fiscal Year, and Tax Rate. Click on the Account Info link. The Organization Name and Address will automatically populate for you. The Organization Name can be edited and will be displayed in the upper left hand corner of the screen. Corrections to the address information can also be made here. The Time Zone and Current Server Date/Time are populated based on your organization's address. The Last Assigned Incident ID defaults to 99, which assigns the first incident created as Incident ID 100. This number can be adjusted in the initial setup, however it cannot be set to a number below 99. The Emergency Phone Number, Pager, and Contact information are optional fields. Comptroller shows the user currently listed as the Incident Comptroller. For more information about the comptroller function, see Incident Users. In the Current Period fields, enter your organization's Fiscal Year Begin and End dates. 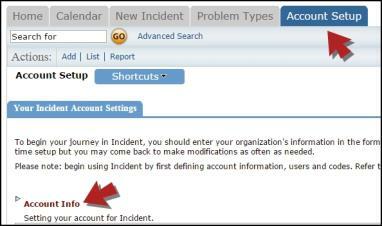 Define the name for Your Incident Custom Category Label. The Custom Category is a reportable field available to track any additional information important to your organization. Enter your Sales Tax Rate here to automatically populate when entering transactions. If your organization is tax exempt, leave this field empty. The Incident Form can be printed in one of two different formats. Select the form you would like to use from the drop down box. *Note: Once there is a incident in the account, you can preview the forms by clicking the Preview link. Define whether the Print Incident Form will be printed in HTML or Adobe format. The Adobe format is recommended if you will be using batch printing. If using a bar code scanner, check Print bar code on the incident form. Checking Default Estimated Start Date to Today's Date will input the date the incident is created in the Target Start Date field on the incident form. Enter the number of days for incidents to be marked as Unprocessed Incidents on the right side of the home page. Click Update Information to save.